I used to live in Cardiff. I spent four wonderful years getting hammered, learning about our planet and meeting interesting people. I had over twelve different addresses (for various reasons) and lived in Cathays, Roath, Canton, Adamstown, Penylan and Riverside. I drank in almost every pub in Cardiff at one time, over half of which are now closed. I enjoyed living in a truly multicultural part of the UK and had friends from all backgrounds, races, religions and cultures. It was a fun time and most people just got on with their lives. There certainly wasn’t this constant bombardment of pc-values that we get today. The barrage of ‘Empire Was Evil – Do You Feel Guilty Yet?’, ‘Stone A Gay For Islam’, ‘Race Hate Crime On The Increase’, ‘Love A Burkha Week’, ‘Hug A BBC Paedo’, ‘Black History Millenia’, ‘Women’s Turn To Be Paid More Forever ‘cos They Have Babies And Do Different Jobs Anyway’, ‘#NotYouTooDuckie’ and so on. And as far as I can remember there weren’t any monocultures in town, apart from the Somalis maybe. Now though, in Cardiff, there are areas that I used to live in, eat and drink in, and walk around that resemble a third world slum. The demographic situation in the United Kingdom is changing and it is changing rapidly. In some areas of the city no-one supports Wales in either football or rugby and no-one goes to the local pub anymore – hence they close. Not many people go to church anymore, unless you count the evangelical cults (often with African congregations) that spring up and then just as quickly disappear when people realise how silly those belief systems are. Many old churches have already been converted into mosques and Islamic centres (a common strategy amongst Muslims over the centuries btw). I used to buy chips from an Italian guy who always asked me how I got on in my last college rugby match. I had a Turkish friend who used to say, ‘Hey wasn’t it great, we beat England again!’ My Bangladeshi mate Mia, in the Jubilee Tandoori used to cheer me up over a Madras and tell me that there were plenty of other girls in the sea. (I think he meant fish, but who can tell?). After the pubs and clubs closed at 2am we’d head for an ‘Indian’ (actually Bangladeshi) and even had credit in the Akash curry house before perhaps popping into town and ‘Cabbies’ to drink with the (white) taxi drivers until 3am or later. Other nights we’d get freshly cooked takeaways at the grill down Clifton Street from the gay Maltese guy at 4am, or we’d get high on passive weed down the docks from all the Jamaican guys smoking there whilst watching live reggae music. We used to play pool with the prostitutes down the Custom House and tell them to hurry up ‘cos it was their shot when one of them ‘got a date’. Once I remember some of the rugby boys took an Iraqi home to hide him from some Iranians who wanted to kill him. It was all good fun. Then I started work and left my beloved city, only returning occasionally to look up old friends and see if the old haunts were still there. Last year, over thirty years on, I took a drive down Clifton Street. I used to live near there back in the 80s and it was a fab community. I noticed three things. Firstly, the traditional Welsh butchers (that used to sell pork sausages) had closed, the Polish shop had relocated to Newport (I later heard that racist Muslim youths had chased the Poles away, smashing their windows etc.) and I also noticed a Burkha shop. I got out of the car and walked around for a bit but got strange looks from everyone. Maybe it was because I was the only white face there? Then I wandered down Broadway and couldn’t help notice the piles of rubbish in the street and all the pubs that were boarded up. Now for some statistics. As of the 2011 census, 13% of the population of the UK were foreign born. So what you might say? I agree. The native, white British population of England sits at just 79%, a dramatic fall from the 91% recorded in the 1991 census. In the 10 years to 2011, the Pakistani, Indian and African communities increased their shares of the overall population of the United Kingdom by 37%, 57% and 63% respectively. Asians not from China or the Indian sub-continent increased their share of the population by a massive 247.9% in the same 10 year period. Suddenly this becomes interesting, if not slightly alarming. Meanwhile, the fertility rate of native British women has fallen well below the accepted replacement rate (2.1), to a staggering 1.7, possibly even lower, whilst the fertility rates of women from Somalia, Afghanistan and Pakistan (living in the UK) – stand at 4.19, 4.25 and 3.82 respectively. Put simply this means that 1 in 3 new born babies in the UK are not white British. There are many schools in the country that do not have a single white British child in attendance. Major cities such as London, Leicester, Birmingham and Luton have seen native, white British people become an overall minority. OK, so what, some of you are saying? Wales isn’t like Birmingham you say. True, it’s much smaller in terms of population. We can always vote to become independent if things get too dark (no pun intended). But 20% of the population of Wales are English born (2001 Census) so I doubt those foreigners would vote for it? Since 2001 asylum seekers have come to Wales from 78 different countries and speak at least 25 different languages. Since May 2004 more than 16,000 migrants from Eastern Europe have registered to work in Wales. OK, a lot of figures to take in so if you’re struggling just look at the graph. Predictions about the native white population of the UK becoming a minority are NOT predictions anymore. It has already happened in certain areas. But whilst the trend is still the same in Wales, like everything we are lagging behind England. 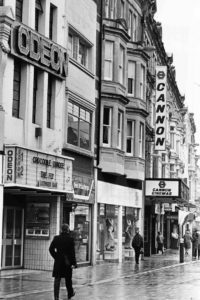 If you remember the ‘old’ Cardiff, get out of the corporate centre and take a stroll down City Road or Broadway and see how many pubs have closed. If the situation doesn’t change then very soon (in our lifetimes) then this will be the case in many areas of Wales as well as the UK. 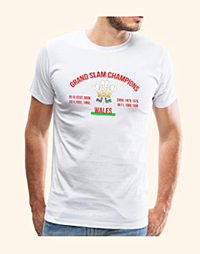 Then who will play rugby for Wales? Where will the next superstar like Gareth Bale come from? Where will we watch the big match if all the pubs have closed? Sound dramatic? Maybe? Now before some fool (“There are none so blind as those who will not see.“) shouts ‘racist’ or ‘populist’ (the new trendy word for racist) all I’m pointing out is what has happened and what is still happening. The multicultural assimilation I lived through seems to have stopped dead in its tracks in certain areas and that can’t be a good thing. The land I once knew has already changed and is still changing. Is it a good thing or a bad thing? I’ll leave that up to you to decide. Another curious fact is that more British citizens leave the UK than return each year. This means that foreign immigration is to some extent offset by net British emigration which has averaged around 50,000 a year in recent years. In simple terms you can add 50,000 to the graph. In Wales we have often talked about the ‘brain drain’ too where young Welsh people move to England for better job prospects. Here is a video from London, 1960s. Not that I’m a fan of the bowler hat mind you. Notice any differences to today’s London? Public concern about mass immigration of people of many different backgrounds and cultures is consistently clear and strong. Migration Watch would like to see net migration reduced so that it is no longer an issue of public concern. This would help to ensure a harmonious society that continues to welcome migrants and the contribution they make to our society. We live in Wales (for the last few thousand years or more) because, in our case, this place seemed right for us, our culture and our values. 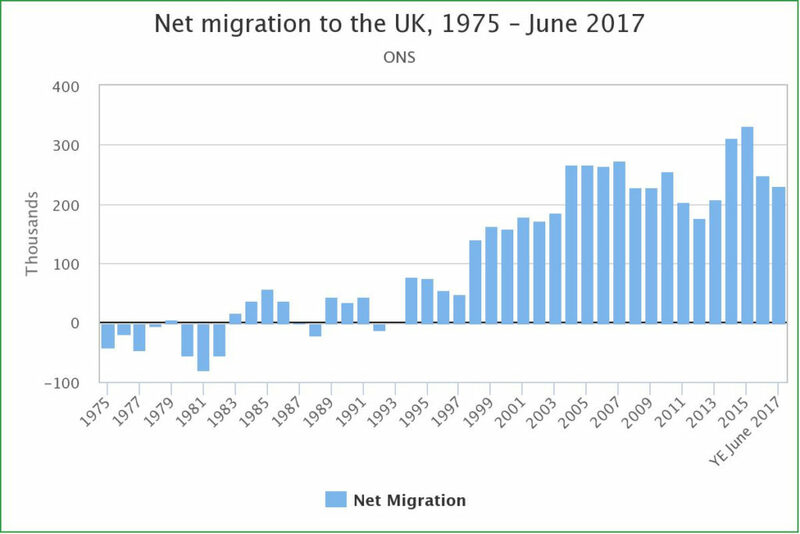 If mass immigration (since the year 2000 if you look at the graph) continues then we are in danger of losing our way of life, of it disappearing or getting out-voted by a different culture. You might think that’s great but I don’t. Personally, I consider myself Welsh (sometimes African) and love to embrace all the good things that different cultures can offer (like pizza from Italy, lager from Czech Republic and blonde, big-boobed volleyball girls from Poland), but I would like to make that choice not have it made for me. What I don’t want to embrace though is all the bad things that different cultures offer (Sharia Law, stoning, FGM, forced marriages, honour killings, face veils and Australians), or in some cases what different people or groups (the looney left, EU, Westminster government, pc brigade, BBC and snowflake thought police) are attempting to force upon me.